Yes, the board taken from the Mickey Glove is my favorite Made With Magic board. That's because both the LEDs and the IR receiver are 'through hole' mounted which makes them easy to replace with onboard JST sockets. Going from 4 LEDs to 2 LEDs is as simple as unplugging 2 of them. Want 4 again? Just plug 'em back in. Changing the type of LED is also as simple as unplugging the current LED and plugging in a different one. Easily switch between diffused, water clear and surface mount LEDs - or mix and match to suit your project's needs. Extend those IR receiver wires and the glove board may be tucked away deep down where the infra red rays don't shine. With careful planning, your hacks might allow complete detachment of the main board from the LEDs and IR receiver that may be intimately embedded in the body of your hack. One glove board could be rotated into a succession of seasonally themed hacks. This would be a very cost-effective way to power a number of different hacks and allow rotation of those hacks so they don't become 'stale'. Similarly, socketing the power connections allows easily switching between the different power options as the situations demand. 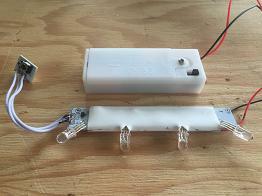 Switch from running off a LiPo battery to a 5V wall wart in seconds. 4 distinct LEDs running off the same socket. like the ones the standard glove device comes equipped with. - To it's right is a water-clear 5mm red LED connected to the red socket wire. - Directly below the RGB led is a water-clear 5mm green led hooked to the green socket wire. - At the bottom is a water-clear 5mm blue led hooked to the blue socket line. While it's not easy to tell from the video, those 4 LEDs on the breadboard are plenty bright. 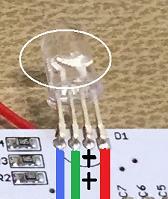 If you're willing to deviate from the intended MWM responses, the red, green and blue leds could be replaced with any other color that uses the same voltage, ie yellow or orange may work in place of the red and white, pink, warm white or violet may work in place of the blue to produce some original effects. In the example above, there were 4 RGB LEDs, each containing 3 LEDs, and then another 3 single color LEDs for a total of 15 LEDs. And that seemed to work OK. So that begs the question: how many LEDs CAN we drive from a single Glove board? In an upcoming post, I'll show that boards running 4 LEDs only increase the current draw by about 30% over the amount drawn by boards with only 2 LEDs. That leaves a lot of headroom below the 400mA cutoff enforced by the boost converter. This very brief video shows 12 RGB LEDs running off a single Glove board and outputting more than enough light to saturate the camera taking the video. White comes across as white without a red tinge. Plenty of light. Current limitations will eventually put a lid on the total number of RGB LEDs that can be added. 12 LEDs are only drawing 19% more current than the original 4 LEDs. Still, 12 RGB LEDs. Pretty amazing. If you haven't already done so, dig the components out of the Glove following the instructions on the Glove's page. The next thing that needs to be done is to remove the stiff white plastic sheath that surrounds the middle portion of the board. Using something sharp, carefully slice off the edge of the plastic sheath on the opposite edge away from the leds. Spread the plastic 'flaps' open and make a note of where the battery wires lay. Using scissors, and avoiding those battery wires, cut the sheath all the way up to each of those slits allowing the two middle leds to poke through. That should allow you to work that plastic sheath completely off the board. Desoldering the LED connections from the board is a lot easier if the leads are snipped off first. The remaining 'posts' may be removed one by one instead of trying to hassle with getting the entire LED out all at one time. Just remember to leave enough wires on each LED if you intend to reuse them later by soldering on connection wires. 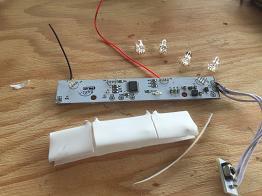 If you intend to reuse the battery wires already connected to the board, go ahead and snip them from the battery compartment, leaving whatever length suits your needs. ​ ​Now go ahead and desolder the posts from each LED attachment on the board. Desolder the IR receiver connecting wires and then clean up all connection holes using a solder sucker so you'll be able to get the new sockets inserted into those holes. 4 - 4 pin JST board socket, 1.25mm, with wired matching plug. 1 - 3 pin JST board socket, 2.5mm spacing, with wired matching plug. 1 - power connector. If plans are for using LiPo batteries and/or the lowest profile connector is desired, you might want to use a 2 pin JST PH connector, 2mm pitch. Otherwise, a larger JST SM connector may be desirable if you plan to switch sources frequently. Those PH connectors are a bear to get undone! shrink wrap for any exposed soldered connections. 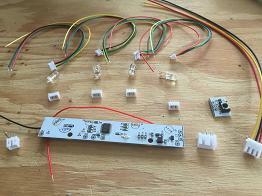 Measure and cut to length the wires for LEDs and IR receiver. ​​ Before soldering it all together, recheck the orientation of the parts that need connecting. The LED pins, from left to right, are: blue, green, 3V anode (+), red. Note the position of the internal components of the actual LED. You'll need to know that to help you orient the pins properly. The IR receiver is a little easier. One of the pads around the holes on the mainboard and also on the IR board are square shaped. Match those up and then connect the others in sequence. 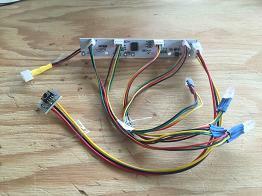 The wires are (from top being edge where the LEDs connect: top(red): gnd, middle(black): data, bottom(yellow): 3V. If you go with the JST PH power connector, verify that the positive and negative wires are hooked up to mate with the corresponding wires going to the power source. Some orders I've received have the red wire on the right. Others, have it on the left. ​ ​Now go ahead and solder it all up and shrink wrap what needs shrink wrapping. Give it a test and If all goes well, congratulations! You now have an amazingly versatile Made With Magic board that can be used as a starting point for a ton of original hacks. For this example, I didn't have a particular application in mind so I simply connected the full lengths of the wires that came with the purchased components. There's no real need to put up with this big of a mess of wires, unless you want to or your project demands it. If you do this hack and make something with it, please do register with this site and post a comment to brag about your prowess. We love to hear about it.